Mixed (65) - 66% of the 65 user reviews in the last 30 days are positive. Mostly Positive (10,030) - 76% of the 10,030 user reviews for this game are positive. Happy New Year fellow Captains! On behalf of Star Trek Online, I am very proud to announce that our voyage has just reached its 9th Anniversary. Our continuing mission: to explore exciting new and familiar worlds, to create new stories and gameplay, to boldly go where no player has gone before. It’s been a wonderful journey. 2018 saw the acclaimed release of Star Trek Online’s 4th major expansion – Victory is Life! It was here Captains explored the Gamma Quadrant and encountered the Hur’q threat alongside our beloved DS9 characters, voiced by the original actors in the largest cast ever assembled for Star Trek Online. For the first time, players created Jem’Hadar Captains, battled heroically in one of our most ambitious Battlezones to date and walked the promenade on our faithfully recreated Deep Space Nine station. We are incredibly proud of Victory is Life and we’re very pleased that so many players enjoyed it. Alas, time does fly. The back half of the year found us phaser focused on setting the stage for our Discovery-era expansion. While not an expansion in the traditional Star Trek Online-sense, we instead wanted to do something a little different and develop this over multiple releases. Unbelievably, Star Trek: Discovery marks the first time that we’ve operated in lockstep with a live Trek TV show. This affords us many unique opportunities to evolve our plans based on the direction of the show and input from the players. Enter 2019. 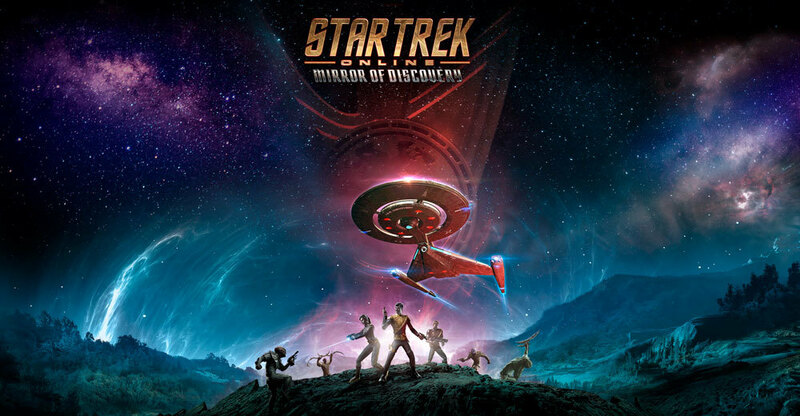 Our journey advances deeper into the Star Trek: Discovery universe with the forthcoming launch of Mirror of Discovery. We have many fun surprises planned including a thrilling new story featuring Mary Wiseman as the Terran Empire’s Captain “Killy”, exploration of planet Pahvo, amazing new ships for players to fly, challenging new threats to overcome and a massive expansion of our Endeavors system. Now is the perfect time for Trek fans everywhere to join us for the voyage ahead. Let’s find out together what’s beyond the second star to the right. ™ & © 2017 CBS Studios Inc. All rights reserved. STAR TREK and related marks are trademarks of CBS Studios Inc.
259 Curators have reviewed this product. Click here to see them.